View the Pecanwood Oktoberfest Website here. Be part of history with the Pecanwood Oktoberfest. Hold on to your hats and gear up for the last ever Pecanwood Oktoberfest Lifestyle Festival. We are going out with a bang this year and have partnered with One Degree Group and are bringing you the world’s longest Slip & Slide as we attempt to break the Guinness Book of World Records. 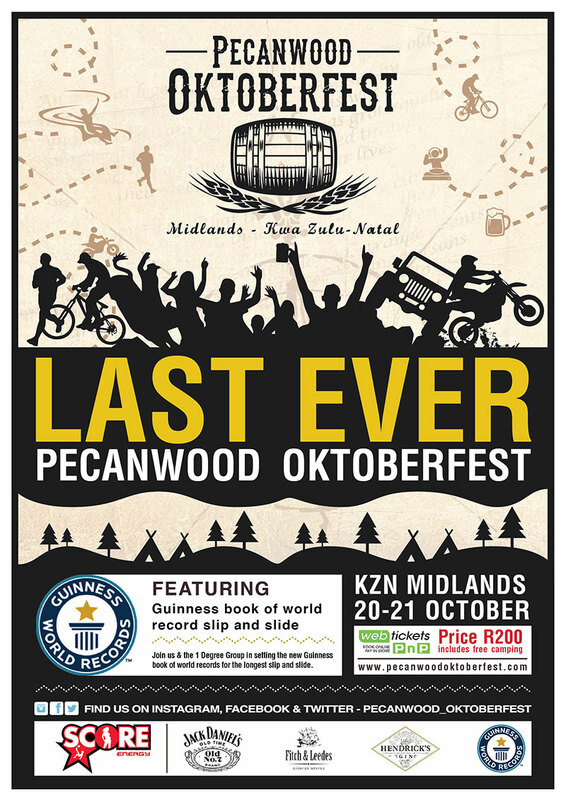 Come Saturday, 20th October from 10am, escape to the KZN Midlands’ Pecanwood Farm where Pecanwood Oktoberfest will be your perfect ‘get out of the city’ event, offering over 24 hours of entertainment. Situated only one hour from Durban and 15 minutes from Pietermaritzburg, this year, embrace the theme #worldrecordslip&slide. With so much on offer, you can now be apart of this historic festival where we attempt to break the official record of a 630-meter slip & slide. So, whether you are a sporting enthusiast, beer connoisseur, thrill seeker, foodie, or just want to enjoy some of South Africa’s top music acts live on stage – this is the place to be. Back for the last time is the very popular 7 km beer shot run and the 14 KM mountain goat trail run through indigenous forests, valleys and escarpments, boasting over 60 % single track with the finish being on the Guinness Book of World Records Slip & Slide. In addition to the sporting experiences such as the trail run, volleyball and action soccer, there is also the exciting 4×4 show, where drivers will be putting on a unique showcase of ‘zuped’ up vehicles with top of the range Land Rover’s courtesy of the PMB Land Rovers owners club. This epic last edition of the Pecanwood Oktoberfest will also have a vast selection of beers from around the country. Jack Daniels will be treating you to his famous Old No 7 whiskey as well the G&T Garden courtesy of Fitch and Leedes and Hendricks Gin. For those not wanting to let the day end, festival goers have the option of bringing their own tent and camping for free. Whether you are a regular or a newbie, the festival is attended by people from almost every province in the country and is sure to be a memorable festival once again. Having boasted over 6 000 people last year, be sure to join us this last year as we celebrate over 8 years of the best times had and set a new world record! Tickets, available at Webtickets, are only R200 per person, include camping and your chance to be part of history with this record-breaking slide. To register for the trail run please book through www.roag.co.za.